Who are Iron Maiden? What is an iron maiden? Who is Eddie? What is Trooper beer? We find out! Iron Maiden are one of the biggest bands on the planet. Forming in Leyton back in 1975, their combination of bombastic heavy metal, headbanging riffs and falsetto vocals has earned them the millions of fans all over the world, with countless sold-out shows under their belt and even their own aeroplane! Since the release of debut album Iron Maiden in 1980, the British heavyweights have released a further 15 full-length studio albums, and sold over 100 million copies. But who are they, really? Where did they begin? What are their biggest songs? What is an iron maiden anyway? Well, we've done the research and brought back the answers to all of your Iron Maiden questions. Who are the members of Iron Maiden? Iron Maiden are bassist Steve Harris, guitarist Dave Murray, guitarist Adrian Smith, vocalist Bruce Dickinson, drummer Nicko McBrain and guitarist Janick Gers. Maiden became a six-piece in 1999 following the departure of former vocalist Blaze Bayley and subsequent rehiring of Bruce and Adrian. Since the band’s formation in 1975, the band have had 23 different members across 13 different line-ups. While Bruce Dickinson is the longest serving vocalist for Iron Maiden, Paul Di’Anno recorded the band’s self-titled and Killers albums, and Blaze Bayley recorded the The X Factor and Virtual XI albums during his tenure. Steve Harris is the only member of Iron Maiden to have remained a full-time member since their formation. Who were the original members of Iron Maiden? The first incarnation of Iron Maiden was a five-piece and featured Steve Harris on bass, Paul Day on vocals, Dave Sullivan and Terry Rance on guitar, and Ron Matthews on drums. This line-up lasted around a year, but many changes occurred before the release of debut album Iron Maiden in 1980. The line-up on the first record was Paul Di’Anno on vocals, Steve Harris on bass, Dennis Stratton and Dave Murray on guitar, and Clive Burr on drums. (L-R) Steve Harris, Clive Burr, Paul Di'Anno, Adrian Smith, and Dave Murray. Who was the first singer in Iron Maiden? Paul Day was the first singer in Iron Maiden, from 1975-76. However, the first recording lead vocalist was Paul Di’Anno who provided the voice to Iron Maiden and Killers. Bruce Dickinson followed for The Number Of The Beast, Piece Of Mind, Powerslave, Somewhere In Time, Seventh Son Of A Seventh Son, No Prayer For The Dying and Fear Of The Dark. Blaze Bayley then replaced Bruce for The X Factor and Virtual XI, but Bruce rejoined in 1999 to release Brave New World, Dance Of Death, A Matter Of Life And Death, The Final Frontier and The Book Of Souls. What was the iron maiden? The iron maiden was supposedly a Medieval torture device, although there is no real evidence to show that it was ever used in such a manner. Essentially, it was a standing sarcophagus with spikes lining the inner walls and the door itself, so when the victim was placed inside and the door closed, numerous spikes would pierce the flesh and vital organs. The spikes were just short enough to not cause instant death, instead the victim would bleed to death over what could be many hours. Spikes were also placed near the face, especially the eyes. Ouch. What are Iron Maiden's biggest songs? 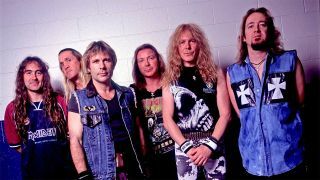 Looking at the viewing statistics of Iron Maiden’s YouTube channel, we have created a list of Iron Maiden’s 15 most popular songs – in descending order. 11. Can I Play With Madness? What are Iron Maiden's best albums? With 16 albums and different line-ups/eras to choose from, picking the all-time best Iron Maiden album is very subjective. But Metal Hammer’s resident Iron Maiden superfan Dom Lawson has ranked the band’s studio albums from best to least-best right here. So there you have it! Powerslave is the best Iron Maiden album. The album that sent Iron Maiden around the world on the legendary World Slavery tour, turning them into global megastars in the process. What genre are Iron Maiden? Iron Maiden were born out of the New Wave Of British Heavy Metal in the late 70s but have since gone on to define what it means to be heavy metal. They have incorporated punk elements in their music – see Wrathchild – and lately much more progressive, dare-we-say experimental elements into their sound on 2016's The Book Of Souls. But their signature galloping riffs and bellowing, operatic vocals will always remain a vital part of what it means to be Iron Maiden. Which member of Iron Maiden is a pilot? Iron Maiden’s vocalist Bruce Dickinson is a fully-trained pilot, having learned to fly in 1990s. Now he flies Iron Maiden around on their world tours on a plane dubbed Ed Force One, covered in Iron Maiden branding and Eddie’s face on the tail. What is Iron Maiden's beer? In 2013, Iron Maiden launched their own 4.1% ABV beer called Trooper (named after the band’s 1983 song The Trooper). It was a joint venture with Robinsons Brewery and has sold over 20 million pints in its first five years. In 2015, the beer family grew to include Trooper 666, which, of course, is 6.6%. This was followed by the Red ‘N’ Black porter in 2016 and a Belgium-inspired hybrid ale called Hallowed in 2017. In 2018, the band launched a 4.1% golden beer called Light Brigade in support of Help For Heroes. Bruce Dickinson at the launch of Trooper beer in 2012.
Who writes Iron Maiden's songs? Bassist Steve Harris is the lead songwriter for Iron Maiden. It’s safe to say the main three writers in Maiden are Steve Harris, Adrian Smith and Bruce Dickinson, but often most members will receive writing credits on each album. Who designs Iron Maiden's album covers? Illustrator Derek Riggs designed all of Iron Maiden’s album covers from 1980’s Iron Maiden through to 1990’s No Prayer For The Dying. Melvyn Grant was called up for 1992’s Fear Of The Dark, 1998’s Virtual XI and 2010’s The Final Frontier. Hugh Syme designed 1995’s radically different 3D The X Factor album cover. Steve Stone designed the London-like Brave New World cover in 2000, David Patchett was responsible for 2003’s Dance Of Death, Tim Bradsheet (famous for his work on the Punisher comics) took the reigns for 2006’s A Matter Of Life And Death, and acclaimed Marillion artist Mark Wilkinson designed 2016’s The Book Of Souls album cover. Who is Iron Maiden's mascot? Iron Maiden’s mascot is the ever-changing undead figure Eddie or Eddie The Head. He first appeared on the single for Running Free in 1980, and has had his zombie-liked face on every single one of Iron Maiden’s albums in some form or another. Originally designed by artist Derek Riggs, Eddie has been a skeletal punk, Satan’s puppet master, a Red Coat during the Charge Of The Light Brigade, an Egyptian Pharaoh and a futuristic cyborg. Eddie also appears onstage during Iron Maiden’s live shows, terrorising the members of the band until he is ultimately defeated – during the band’s Book Of Souls tour, Bruce Dickinson ripped Eddie’s beating heart out of his chest. The monster that is Eddie has featured on countless Iron Maiden t-shirt designs over the years, and has become the star of two video games – Ed Hunter and Iron Maiden: Legacy Of The Beast. Iron Maiden was founded in 1975 by bassist Steve Harris, the only original member still playing with the band today. The band formed in the Leyton area of London, making their live debut in May 1976 at St Nicks Hall in Poplar, London, and following it up with shows at the Cart And Horses pub in Stratford, London. The original line-up of Paul Day, Dave Sullivan, Terry Rance, Steve Harris and Ron Matthews changed six times before Iron Maiden released their debut self-titled album in April 1980. Iron Maiden are on the cover of the new issue of Metal Hammer, available in shops now and from our online store.